We now have a mailing list for this clown. 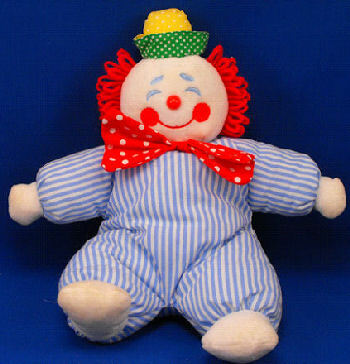 I’m looking for an Eden 12 inch white happy clown with an embroidered face and a red plastic nose. It has red yarn loop hair. He’s wearing a blue stripe suit with a big red and white polka dot bow and a small green and yellow polka dot hat. I hope that you can help me!!! Is there any way you could locate one of these clowns for me?? I am in the UK, but will be very happy to pay for shipping. I did manage to find one in the US on e-bay, and a friend bought it from me via her e-bay account as the seller would not ship to the UK, but unfortunately it never arrived at her house. My daughter is now 19 but has had 3 of these clowns during her childhood and still has a very old ragged one. I would love to be able to replace it as a surprise! Newly listed:) This style Eden Clown is pretty hard to find, Good Luck. I have an eden clown….let me know if you are still looking. I can ship to the UK if you have paypal. I can send you a picture of the one we have so you can see him. Ebay 180688341138 buy it now or make offer. He is listed on ebay right now! Buy it now or best offer with FREE shipping!!!! ebay #230828047951 2 hours left no bids reasonable. not sure if there is still a need for this clown, but there is one on ebay. Buy it now or best offer with Free shipping! Thanks, Carrie!! Sent to the list. Looking for this exact doll. If anyone knows where i can find one please let me know.